Well, it’s been a busy week in Guapton. TMWGITU was away for a week. But she came back! And That made the rest of the week bearable. That, and the great posts I was lucky to see this week. H.E Ellis kicked off her new published book with interview with Death (and you can click through for interviews with the rest of the Horsemen). Ashley told a wonderful dating story, with a moral! ketchup writing prompt, and I can’t wait to read the entries! Finally, Becaa honored me with a Versatile Blogger award! She’s delightfully bent, so you should give her a look. And Pudding Girl gave me an award! I’m not sure why, but if you want a re-ward, check out her site – great stuff! But last week wasn’t just about seeing all the cool stuff in the ‘sphere. It was also about last week’s poll! 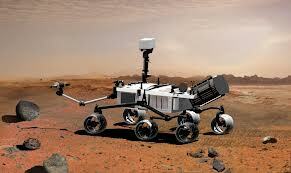 We asked What should Curiosity rover focus on? transform into a health club for Martians so they won’t invade Earth! Should have taken Justin Beiber w/ it & rid our planet of the little freak! Congratulations to Benzeknees for this weeks winning answer! I’ll see if I can’t put together a letter that won’t excite the security agencies that can be sent to NASA. And from the available choices, the most popular answer, by far, was BUILD A BAR!!! (That’ll get those aliens to stop by!). Because it’s all about finding aliens. What? That’s what I meant, isn’t it? A serious note before the poll – I’ve been lucky to meet a whole lot of teachers in my online adventures. The job you do is incredible, and you all deserve every honor for doing it day after day, year after year. But it’s a brand new week. A week that brought the first day of school to most of the United States. And that makes us wonder, are kids learning the right things? Or should the curricula be updated? That’s this weeks poll, everyone. So break out your number two pencils* and get ready to fill in the answer bubbles. Fill in the boxes completely,and fill them out often,but fill them out before Thursday, 13 Sept, 2359 EST,because that’s when this one closes. And if you write an answer in and leave an ID, I’ll link back to you next week. And until next week, enjoy this. Yeah, no theme or explanation. I’m just feeling goofy. This entry was posted in BIG FUN, Friday Foolishness, NASA, Uncategorized and tagged Friday Foolishness, Hot For Teacher, how polls ruined my life, teachers rock!, Van Halen. Bookmark the permalink. There really are, Kanerva. Though it’s even better when you’re in there. I hope everyone pops over to your site, puddinggirl. It really is a good place to visit. No idea how you ended in spam, but my pleasure! NIce one, Guap. Have a great weekend! Thanks kayjai – you too! I’ve got no answer to your poll question…I’m just glad they started school. Looks like fun, but definitely more work than a poll. Amen, and right back atcha, whitelady! Love that one from Gary Larson! … put I wanted to stop by and say hello. Great to see you, Frank, and looking forward to hearing your announcement! I haven’t thought about “Hot For Teacher” in a long time! LOL! Remember that cheesy video? haha! I’m gonna take a listen right now. Have a WONDERFUL weekend, Guapo!!!! I would never have guessed that line was yours, Lisa. Lily maybe, but not you. Well played! Hope your weekend is fun, and your next house showing goes even better than the last! There was never a doubt you would get the Zak reference. Best video game ever. I had that Far Side comic on a shirt back in the day. Wore it well. The Zak reference was a trip down memory lane, BT! And I can’t pull/push a door the wrong way without muttering “school for the gifted” under my breath. And on that note I bid you a grand weekend!!! Can’t go wrong with the classics, FPP! OMG you made mention of Bobcat Goldthwaite and Hot For Teacher in a single post. I love you. Oh, wait until you see next weeks closing goofy video, Waiting! Though I’m pretty sure you know what it is already. First day of school… the real Mother’s Day! Woo! Learn? That’s easy, how to talk. It’s a lost art being colonized electronics — all manner of devices and LCD screens. How to listen should be tackled in college, but perhaps by then it’s too late 😦 So that’s my pole answer, any or all, you decide! Glad your BTINWISWU is back! what is that? Well said, Laura! Communication skills should definitely be taught from as early an age as possible! TMWGITU is The Most Wonderful Girl In The Universe – my wife. Sap is good! Ok, now I’m a little more In The Guapo-Know. Ha. Have a great weekend! *by* electronics. sorry! Oh, and *poll* answer! Man, that Van Halen song had my mind in the wrong type of brain lounge!! Pencil sharpeners? Very nice, Nicole Marie – use the tools of the man against him! And then just talked in detention. I was suspended once, in third grade. Catholic school. Some friends and I walked across the street during recess to buy some lollipops. It was the best, laziest two days of watching cartoons EV-ER! I got suspended twice in grade school. One involved a very small amount of fireworks (honest, no one was hurt! ), and the other was a simple experiment was gravity. Yes, 30 some odd years later, and that’s still the story I’m sticking with. My folks didn’t let me sit around for the time off. You can never get enough Uranus gags when it comes to the solar system. Brings out the 8 year old in me. Had a good giggle – thanks. I can only imagine that when they were naming the planets, all the guys were jealous of the one who came up with Uranus, GfB. Agreed – can you imagine some little scientist trying to get Pluto named Big Knob and being upset when he loses out to the Disney fan? You always have your finger on the pulse of America don’t you? You are a keen observer, a font of wisdom, a guru to us guru’ees…a pied piper to those of us who are “pie-eyed”….I’m exhausted, I’m going to find some chocolate..but well done your Guapo-ness. Oh I see…this is how it starts..first you suggest an intervention, then the next thing you know I’m being sent to rehab…then I find out it’s a scientology rehab and I’m going to have to marry Tom Cruise..and then I’m forced to start a career as a Movie star….OH CRUEL FATE!! See…all this and NO CHOCOLATE WAS EATEN!! I think you once said you were over 5 feet tall, so I’m pretty sure you’re too tall for Tom. Guess you’ll just have to keep taking pictures and writing books. And I believe you about the chocolate. So go get some – the withdrawal is starting to show! Thanks love ((hugs)) You’re too cool for skool 😉 all of my best friends are teachers. It is the nerd in me. A good teacher is worth their weight in gold, Becca! It’s my goal to be known as WordPress’ premiere site for Friday Foolishness, Linda! As far as the other blogs, Aww shucks – I hope you get to check some of them out! Please tell me you’re doing it in a ripped tank top and red leather pants! Hey, there’s only like 45 comments ahead of me–did you just publish this thing ten minutes ago? Maybe I got here quicker, which goes to show that the spoken word hasn’t robbed me entirely of free time. I loved Quirky’s answer (although, honestly, it was hard to find a dog in the bunch; pretty funny this week). Every time I hear Hot For Teacher, I think of all the Mary Kay Laterneau stories of teachers molesting their young students, I think, where were these brave women in my day, and I can only hope for a brighter future for my own boys. I think I’m joking about that last part, by the way. I’m like 95% sure. For this week’s poll, I voted for not naming kids terrible things like Honey Boo Boo, but I really shouldn’t talk. My middle son’s full name (first & last only) are but two letters away from being identical to a fairly well-known alcoholic beverage. I assume that Honey Boo Boo at least has a normal REAL name to fall back on. My grandfather’s name was Glenn, and that was about the ONLY normal name in my family before or since. Break the naming cycle, Smak! Or, whenever I suggest a great name for a kid, like Bocephus, my wife says to me “If you don’t like kids, you shouldn’t have them.”. Perhaps I wasn’t clear; the damage has already been done. It will be up to my three sons to break the cycle of weirdo names. I have to ask, do you or the wife ever slip and call them Monty or Narville? No, but when we chose “Blago” for our third child (during the big Rod Blagojevich scandal)–I had a hard time right after he was born. This time around, everybody knew it was a gag name (they were never 100% sure with M&N), so everyone we knew just called the pregnancy “Blago.” And then he was born and after four months of calling him “Blago,” we had to suddenly start using his real name. Every week, HE. But yours was pretty productive! Nice! I usually have a hard time picking a winner for these, Benze. Yours just called out to me this week. Is it sad that I come looking for my own entry? I like these. I need to come up with something witty for this week’s when I’m less pooped. Not at all, JJ. I do the same when I check for replies to comments I’ve left elsewhere. Have to see my brilliance before I can appreciate anyone elses! The pressure of having to fill in the cirlcle with the number 2 pencils that brings up some old trama’s. With Navar teaching I’m often thinking about how the school system in general can change for the better, and how some things are just plain out dated. On the other had there have been some improvements tecnology for one. Hope you guys are having a good weekend.